The Coast Guard does not recognize the existence of the so-called Bermuda Triangle as a geographic area of specific hazard to ships or planes. Different "authorities" have different definitions of the supposed Bermuda Triangle. The most widespread and possibly oldest one has Bermuda, Miami (roughly), and San Juan of Puerto Rico as it points. The area is known for the many strange incidents involving ships and airplanes; disappearances, ships found abandoned for no apparent reason, weird messages ... Many theories have been brought forward to explain the phenomenon, all the way from completely natural to downright supernatural; huge bursts of natural gas, Atlantean machinery, spaceships, portals to other "dimensions", and so on. But when one takes a closer look at the incidents, what is actually known about each and every one of them rather than what is told and re-told in Triangle lore, most of them turn out to be considerably less mysterious, many haven't taken place anywhere near the Triangle anyway, and the remaining ones are not unusually many. The mystery simply doesn't exist. If it had, it's strange indeed that nobody seems to have taken any notice until 1950. (A brief note by Columbus is sometimes mentioned, but his observation was neither unexplainable nor very spectacular, and it anyway took some 450 years until anyone else had anything to report.) Shipping in particular has been well established indeed in those waters for centuries, during many of which people certainly didn't mind colorful descriptions and explanations of marine phenomena. The Triangle is, as far as known, first mentioned in 1950. It didn't become really well known until 1974, when Charles Berlitz published The Bermuda Triangle. Most descriptions of strange things, here called "anecdotes", come from him, directly or indirectly, and I've used his book as the main source of Triangle Lore. (Interested readers ought to see Vincent Gaddis article from 1964, where he coined the term.) One interested reader of Bertlitz was Larry Kusche, librarian, pilot and mythbuster with a knack for scepticism. He had already studied the Triangle for some years, but arrived at a completely different conclusion: the tales being told frequently have more than a dash of "manufactured mystery", when they are not downright make believe. Here are some of the errors in the anecdotes. The first two are particularly common. Incidents not taking place anywhere near the Triangle. Bad weather isn't mentioned, or magically turned into fair weather. Other details improved or forgotten - as when unexperienced pilots become experienced, radio communication turns more weird and intriguing than it ever was, or when failure to observe debris can be explained with bad weather and/or late search expeditions. Ships abandoned in good order (the crew being taken aboard another ship) are later found empty, or ships feared to have been lost turn up in excellent condition. Let me tell precisely what I conclude regarding the Bermuda Triangle, what I don't, and what one possibly could or couldn't conclude. First, nobody can show that no unexplained, or unexplainable, disapperances have ever taken place. A small or medium-sized boat that rams a whale or floating log can go down in no time, leaving survivors and debris to be spread away by the mighty Gulf Stream long before anyone begins to look for them. To reconstruct such a chain of events might very well be impossible. What is certainly possible, though, is to find that many of the anecdotes are not the evidence many assume. The Triangular apologetics do have a habit of uncritical retelling of urban legends, with widely varying veracity. Enter people like Kusche: he doesn't explain every incident, which is perhaps not possible even in theory, but he does show that a sufficient number of the anecdotes have a sufficient number of problems to clearly indicate that there is something fishy with the entire concept. Because the main point of the Triangle is the number of supposedly mysterious and/or unexplained disapperances. If it cannot be shown that they are perceptibly many more there than in comparable areas around the world, then you have an area which isn't remarkable - and the myth disappears. As long as the basic facts (year, name/spelling of ship/plane) haven't changed too much, such errors and others can be corrected by checking with the sources. When these really have nothing to say about a supposed incident, even after reasonable amounts of search term adjustment, one can wonder what have happened; a common case of data mutation, or a concieved tale that never was? - That's where we amateurs can make a difference. Anyone who can show that Lotta of 1866, Stavenger (sic?) of 1931, or the pilot Carolyn (Helen?) Cascio of 1964 has ever existed is more than welcome. There are no records of this ship. LK supposes that it actually is the known ship Rossini. She hit a ground, was abandoned, and eventually towed to port. Found abandoned between the Azores and Portugal, i.e. in the east Atlantic, nowhere near the Triangle in the west Atlantic. A true mystery of the sea. Seriously studying it is not for the faint of heart, with reports that differ from the very beginning. As when she is mispelt Marie Celeste. A training ship in the Royal Navy, the crew of 250 included some 200 inexperienced young sailors. Probably went down in a powerful storm, which sank other ships as well. It's route crossed the Triangle, but she could have been well outside when she sank. EA comes across an abandoned ship. Some crew members board it, the ships become parted in foggy weather - and the next time they meet, the "prize crew" is gone. The only source LK has found is a Rupert T. Gould, a good sceptic who still didn't give any sources for this particular anecdote. The location is only given as somewhere in the Atlantic. Quasar suggests a renaming to Meta may have confused the truth (if any), and a change of flag from British to German as well. The records does indicate this took place in 1881. Apart from that, not a trace of a story as the one told has been found. Left port in Manzanillo, was abandoned the following day, found drifting. But the Manzanillo in question was not the one on Cuba, but another city with the same name on the west coast of Mexico. In 1895-98, Joshua Slocum was the first man to sail single-handedly around the world with his Spray. The seaworthiness of the couple nine years later has been questioned. He left Martha's Vineyard (not Miami as told by CB) heading for the West Indies. His planned route did cross the Triangle, but nobody knows whether he went down there or somewhere else. Was probably sunk in a storm off Norfolk, Virginia. If it sunk before that, it would have been in the Triangle; but the storm would be a simpler explanation that still suits the facts. The disappearance was never thoroughly investigated due to the Great War. Found abandoned off North Carolina. The ship went fine, minding it's own business in perfectly good weather, when it suddenly transmitted a mysterious message: "It's like a dagger! Come quick!" - and that was the last thing anyone heard of her ... Really? Not even close. The japanese freighter was caught in a storm, the distress message was "Now very danger, come quick", and despite Homeric och Tuscania coming to the rescue, it went down with the entire crew of 38. This well-documented tragedy took place east of Boston. Probably went down in a storm. No Stavenger nor Stavanger (which would reflect the spelling of the Norwegian town) were reported lost in 1931. Nor, actually, does the record indicate that such a ship even existed in 1931. An explosion ruined the engine, the crew was rescued by another ship. The John and Mary drifted into the Triangle, where it was discovered by a third ship. Similar to John and Mary: Was discovered in a less than seaworthy condition, the crew was rescued. The drifting ship was later sighted by a third ship. It was never, however, near the Triangle. Found drifting in the Mexican Gulf, with broken sails and steering system. The crew had probably been washed aboard by a recent storm. Found drifting, the only living being aboard being a dog. A torn anchor line and a recent hurricane could indicate that the crew went ashore somewhere for shelter, and that the ship broke off. This disappearance is by far the most well known in the Triangle lore. LK wrote an entire book on it, The disappearance of Flight 19 (1980). The anecdote in short: Five military airplanes on a training flight disappear east of Florida, under very odd circumstances. A plane that was sent looking for them disappears as well. The solution in short: Reading the primary sources with e.g. the actual radio communication (rather than the tabloid versions à la CB), the air of mystery all but vanishes. LK described the disappearance of this airplane as "truly a modern mystery of the air" - there is simply no likely explanation, only unlikely ones. (Not that the Avro Tudor was never involved in accidents.) The plane disappeared on it's way from the Azores to Bermuda, that is well outside the Triangle. In 2009, Tom Mangold presented some possible explanations for this plane and Star Ariel. A failed heater forced the plane to fly low, which burns fuel faster and also leaves less margin for manoeuvring, not to mention time to send distress signals. Famous jockey (Snyder with Gaddis and CB) took a fishing trip with two friends and disappeared. The anecdote often fails to mention that they left at 5 PM, and that the wind was blowing at a less than merry 25 m/s. In the anecdote, the plane communicates with the Miami control tower when, 50 miles south of the city, it suddenly becomes silent. No traces of the plane are found in the shallow waters. In reality, the DC-3 was never in touch with Miami, the position given was overheard in New Orleans, and could very well have been wrong. Before take off, the batteries were found to be in a bad shape. The pilot Linquist had them refilled with water, but apparently didn't consider it necessary to wait for the hours it would take to recharge them. Lost somewhere between Bermuda and Jamaica. As with the Star Tiger nothing stands out; the weather was as fine as in the anecdotes, the crew experienced, plane and equipment in good order, and so on. Due to a communication glitch (the plane never got in touch with Kingston, Jamaica) the rescue operation was delayed several hours. Tom Mangolds investigation (which included Star Tiger) suspected the heater. These was pretty new, used fuel, and several dangers were caused by its proximity to the hydraulic pipes. An expression in the official report could have been interpreted as fuel by the Triangular theorists: "some external cause may (have) overwhelm(ed) both man and machine". True as it is, it certainly is no acknowledge of flying saucers, doomsday rays or kraken. The anecdote gives a vivid image of a 350 foot ship, calmly sailing out of reality, into the mysterious realms of Triangle lore ... She actually was 185 foot, to mention one error, and probably went down in a storm which the anecdotes mysteriously doesn't mention. LK: "The evolution of the Sandra's story in the Legend of the Bermuda Triangle is one of the more interesting examples of what can happen when authors take their information from each other, rather than from original sources." Debris 600 miles southwest of Ireland indicated that the plane had exploded in the air. Heading for Newfoundland, it was never close to the Triangle. The event is often misdated to 1950, an error which goes back to Gaddis. Despite CB describing this disappearance as one of the most remarkable to take place in the Bermuda triangle during peace time, it didn't, according to himself, take place there. The de-commisioned Brazilian warship was being towed from Rio de Janeiro towards England when it broke free, southwest of the Azores. "... Were missing in wind-lashed seas off the southern coast of Florida". Two other ships that also were reported missing in the storm did not make it to Triangle lore. The Coast Guard eventually found a lifeboat from the yacht. An airplane that disappeared for unknown reasons north of the Triangle. The searches began hours later, in darkness. Disappeared in the Mexican Gulf, west of the Triangle. Hard winds at the time. The investigation arrived to several possible explanations, as an explosion in the cargo or capsizing. Since this ship (as well as the Southern Districts 1954, mentioned by LK) had been rebuilt to a more efficient shipper of molten sulphur, only one watertight compartment had been left. A 63 foot charter vessel lost south of Jamaica with an unlikely 40 fishermen aboard. Debris was later spotted in the area, and a corpse that the sharks were dealing with. The tanker planes probably collided in mid-air. The anecdote mentions two spots of debris found several hundred miles between each other, which does sound strange enough; but one of the spots was described as "seaweed, driftwood and an old buoy", and obviously had nothing to do with either plane. (CB erroneously calls the Cargomaster C-132, which makes this anecdote easy to spot; the C-132 was a concept plane that never took off.) It's last position was some 80 miles southeast of Cape May, New Jersey. Searching gave nothing, and according to the press, "some said they held little real hope for survivors because of high wind and seas in the Atlantic area ..."
Carolyn Cascio is called Helen in some anecdotes. In a light plane (a Cessna 172?) with one additional passenger she disappeared during a flight from Nassau to Grand Turk Island (Bahamas). She reported that she had got lost and was flying over two unknown islands, "there's nothing down there" - while people on the ground saw a desoriented plane circling around. LK doesn't mention Cascio. I have yet to find any period sources for either the pilot, the disappearance or any similar ones. Quasar mentions a lost Cessna 1972 "near Grand Turk" 1968, without further details. Considering this is one of the weirdest anecdotes, yet with far better documentation potential than most (eye witnesses! ), I find it strange that neither believers nor sceptics have researched it more thoroughly. The plane disappeared in darkness and 20 m/s winds. This disappearance is sometimes connected with the sighting a so called UFO by Gemini 4 astronaut James McDivitt. Whatever that is supposed to mean, it must be said that U F O stands for Unidentified Flying Object. McDivitt: "The object which I saw remains unidentified. This does not mean that it is, therefore, a spacecraft from some remote planet in the universe. It also doesn't mean that it isn't such a spacecraft. It only means I saw something in flight which neither I nor anyone else was ever able to identify." Disappeared between Fort Lauderdale and Bimini (between Florida and Bahamas). Debris was found. Cause unknown. LK mentions a "black week" which I haven't found in CB. It includes a Beechcraft Bonanza and a Piper Apache. The first might have had an engine failure, the second could have run into foul weather. Debris was found after the YC-122 only, possibly because it's pilot was the only one to leave a trip plan (which is highly recommended, Triangle or not), making work considerably less difficult for the rescuers. In the anecdote, the weather is perfectly calm when some gentlemen leave the Miami harbor to admire the city by night. On the contrary, the winds were strong enough to create "a carpet of foam" and metre-high waves. Since the engine had stopped they couldn't steer up the waves and could have capsized easily. On the other hands, the vessel supposedly was unsinkable (styrofoam blocks). CB describes the Maple Bank, found drifting upside down. It was actually the Maplebank that spotted an unnamed ship drifting upside down northwest of Africa. According to CB the plane disappeared without a trace. In reality, the plane crashed in the Everglades swamps in souther Florida and was found 25 minutes later. 99 people died, 77 survived. The investigation explained that the plane simply flew too low, for whatever reason. The "dramatic" descent that Valentine describes in CB (however dramatic +200 metres in 40 seconds really is) never took place, it was quite the contrary: "a very gentle descent until it struck the ground". This is a very good example of just how sloppy CB and his sidekick Valentine are. This catastrophe was in fresh memory when the book was published. Reno Rigoni and co-pilot Bob Corner disappears with their Cessna between Fort Lauderdale and Freeport, northwest Florida. I have yet to find any reliable information whatsoever about this. If confirmed as told, it still took place outside the triangle. Considering how many of the incidents that have taken place outside the triangle, it rather appears to be quite a safe place. Who writes a bestseller about that? 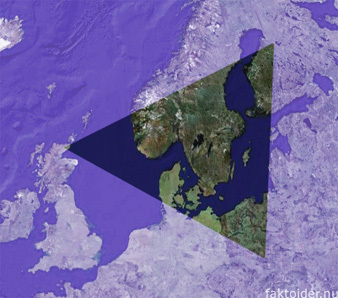 The "classic" triangle has a side of about 1 000 miles, and an area of about 400 000 square miles. This area, larger than many countries, sees a vast amount of ships and airplanes. Still, many of the supposed triangle-related indicents have taken place somewhere else. 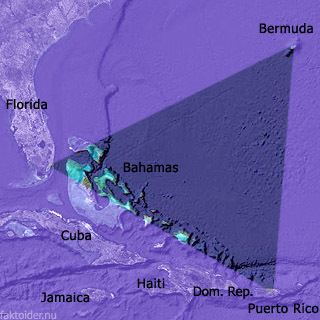 Almost half of The Bermuda Triangle is about other things than the Triangle. For example, Berlitz mentions the famous Maelstrom. This natural phenomenon has been exaggerated for at least 500 years - his source is Edgar Allan Poe, who didn't mean to and shouldn't be taken seriously. He writes a good deal about the lost Atlantis and it's technology, the supposed high level of which has far less to do with Plato than the alleged clairvoyant Edgar Cayce, who Berlitz appear to trust completely. UFOs, hilarious associative archaeology in the von Däniken vein, and similar stuff; all in all, a few mispelt names doesn't really feel like a problem worth mentioning. Still, all Triangle believers are not as imaginative and sloppy as Berlitz (Ivan Sanderson is possibly worse). But the more careful and honest studies you make of the alleged mystery, the less of a mystery you're left with. ... A little imagination, a few silly unanswered questions, a few references to other occurrences in the same area (accurate or not) can turn almost anything into a mystery. United States Coast Guard, FAQ: Does the Bermuda Triangle really exist?